Fresh off his world-beating win at the Carolina Cup, Titouan Puyo is set to tackle the titans of Tahiti this weekend, with the big Air France Paddle Festival providing an international showcase for what is arguably the strongest paddling nation on the planet. Titou will certainly have his work cut out for him though, with the NSP and Quickblade team rider lining up against the likes of Georges Cronsteadt and a dozen ultra dark horse contenders that know these waters like the back of their hand. The event will be webcast live on Saturday, and with over 300 paddlers pre-registered it should be a great showdown. 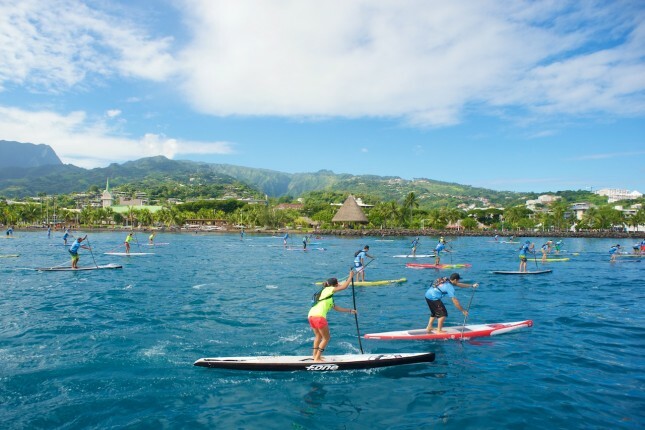 I like to think of Tahiti’s Air France Paddle Festival as a “regional major” event, one of many great second-tier races around the world that compliment the established ‘majors’ such as Carolina, the Gorge, the PPGs and Molokai. Tahiti is well known as a paddling powerhouse, and the Air France race is clearly its standout, international-level event. For that reason, the 2016 Air France Paddle Festival will carry a guaranteed 20% weighting on our Race Index, which will give the local elite athletes a chance to feature on the SUP Racer World Rankings leaderboard. While the level of talent in Tahiti is undisputed, their paddlers rarely get the recognition they deserve because not many get the chance to race outside the islands. That means our “Race Index” formula underscores races in Tahiti, because they haven’t had a chance to already establish a world ranking at the big international races. So hopefully this change is one small step towards the wider stand up paddle community giving much more attention to SUP racing in Tahiti in the future. I spoke with event organiser Jerome Loisel last night, and he told me there were already 320 competitors signed up, with many more likely to join in the final 48 hours before the horn blows. The Air France Paddle Festival offers three different races that cater to all levels of paddlers, however the main event is the 24km (14.9 miles) race that stretches through both the open ocean and the lagoon inside Tahiti’s famous outer reef. Right now the forecast is for a good wind direction, meaning there should be a solid downwind leg (last year was remembered for light winds that turned the race into a very long, very hot race). The course runs from Pointe Vénus, along the north-west coast of the island, past the capital of Papeete, and finishes inside the Taapuna reef pass. The map above gives you an idea, and you can also check out a Google Maps snapshot of the area to put it all in perspective. 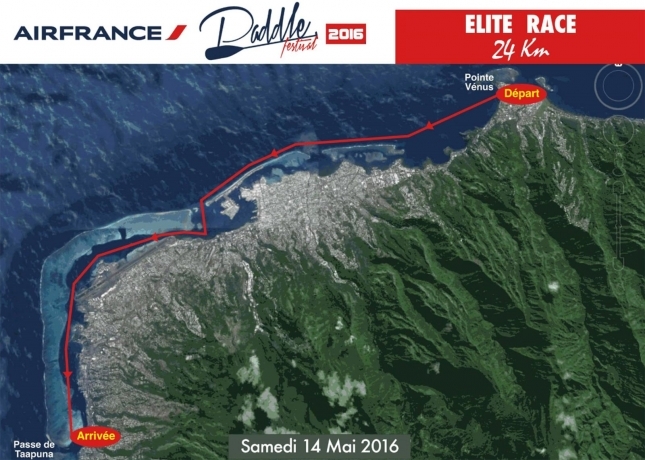 The local contenders will be very familiar with this course, not only from previous Air France races (this is the 3rd annual edition), but also from their regular racing and training sessions in Tahiti’s national sport of “va’a” (outrigger canoe). For those who only know the stand up version of paddling, Tahiti is considered the undisputed powerhouse in the world of outrigger canoe racing, a sport that is extremely similar to SUP racing and which produces many world-class cross-over athletes (Danny Ching and Travis Grant, for example). Tahitians are virtually unbeatable at all the major outrigger races, and now the nation’s hometown heroes are crossing over into the SUP racing world in increasingly large numbers. There is so much “dark horse” talent in Tahiti that anyone who makes the podium this weekend will have thoroughly deserved it. But the guy everybody wants to beat is definitely Titou, who has enjoyed a meteoric rise in the sport over the past two years – following his victory in Carolina, Titou edged past Danny Ching to claim the world #3 ranking – and will now surely start favourite at every race he enters from now on. In many ways, Titouan Puyo is just like the dark horse contenders in Tahiti: He has an outrigger canoe background and was a virtual unknown on the international stage before a series of breakout performances in 2014 and 2015. Indeed, Titou will be feeling right at home in Tahiti — he was actually born there (so that explains it), while he grew up on another French-speaking South Pacific island, New Caledonia. And while this is his first SUP race in Tahiti, Titou has competed there many times in va’a events. So much for the home ground advantage the local paddlers would have been hoping for. But which of the Tahitian titans will give Titou the toughest test? The long-standing king of Tahiti’s SUP scene, Georges Cronsteadt (SIC), is the defending champion at the Air France Paddle Festival and will fancy his chances of going back-to-back. And for good reason: Georges very comfortably sat with the lead draft train almost the entire way around the 20km Carolina Cup “Graveyard” course a few weeks ago, falling narrowly short over the final half a kilometre. Georges was the only well-known Tahitian stand up paddler for many years (remember that time he finished 4th behind Connor, Jamie and Danny at the 2011 Battle of the Paddle California? ), however he’s now been joined by the next generation of Tahitian paddling stars, many of which will give him some very stiff competition this weekend. The runner-up at last year’s event, and one of the real dark horse names to watch in 2016, is Rete Ebb (Starboard), who debuted on the international scene at the Carolina Cup last month before backing it up with a strong result at the massive OluKai Ho’olaule’a on Maui. 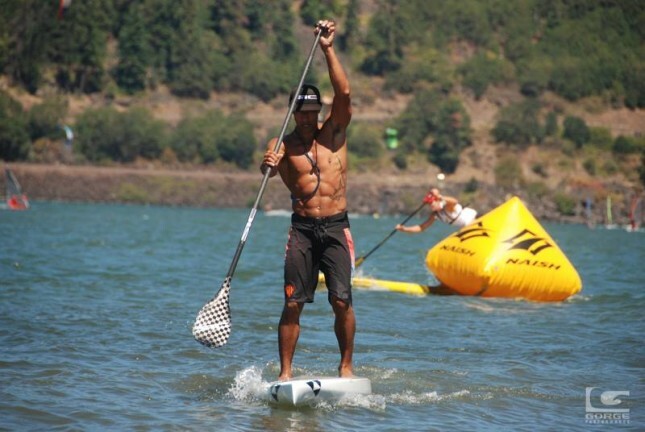 Speaking of OluKai, one of the surprise packets in the top 10 on Maui was Manatea Bopp du Pont, a complete unknown in the SUP racing world that has clearly made the crossover from sit down to stand up paddling quicker than most. I’m very keen to see how Manatea performs against his compatriots on Saturday. Niuhiti Buillard (Team 404) has featured at a few international events over the past couple of seasons, however he still doesn’t get the credit he deserves. Niuhiti was in contention for the win at Air France last year but faded late to finish 4th, so he’ll be hoping to go a few spots better this time round. Edging out Niuhiti for the final podium spot at Air France 2015 was Bruno Tauhiro, who turned heads at the 2014 Gorge Paddle Challenge with a breakout performance. Bruno is from the Georges’ generation (as opposed to the rest of these guys, who are all about 10 years younger), meaning he’s “retired” from serious outrigger competition and focuses most of his training on stand up. Look for Bruno to be up near the pointy end of the field once again this weekend. 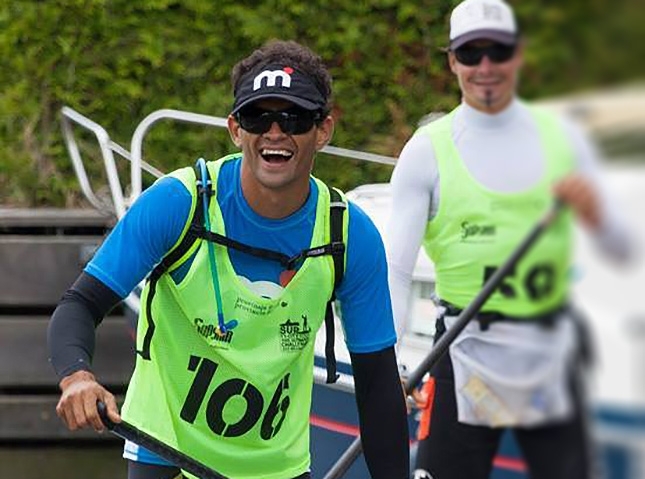 Also racing on Saturday will be another famous name from the Tahitian va’a paddling scene, Steeve Teihotaata from Team Mistral. I was hanging out with Steeve in the Netherlands last year, so I got to see first hand his absolutely extraordinary performance when he destroyed the field in the five-day, 200+ kilometre SUP 11 City Tour, arguably the toughest race in the sport. Steeve will be another one to keep a close eye on this weekend. Also look out for the very experienced Tamarua Cowan, who’s a rarity in the Tahitian stand up paddling community in that he didn’t cross over from outrigger paddling (Tamarua has a triathlon background). And there could be two “Cronsteadts” near the top of the results sheet, with Georges’ younger brother Yoan Cronsteadt a definite contender. 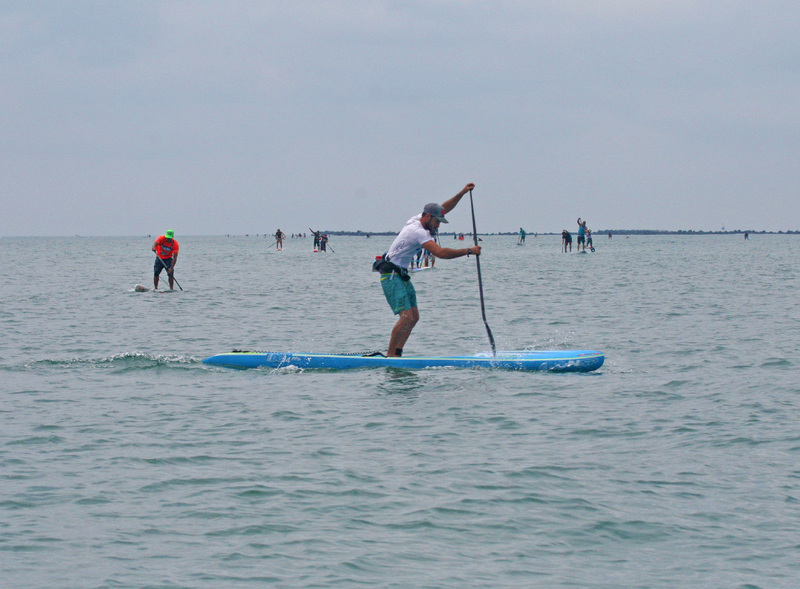 Yoan finished 5th at the 2015 Air France Paddle Festival. On the women’s side, I’m not entirely sure of the start list but I assume the queen of Tahitian outrigger, Hinatea Bernardino, to be one of the favourites. Hinatea, who paddles for the Starboard team, was runner-up 12 months ago to none other than Annabel Anderson. Another podium favourite will be France’s Olivia Piana, who, just like Titouan, earned a free trip to the Air France Paddle Festival after winning the 2015 Paris Crossing race. Those are just some of the names to look out for during the live webcast on Saturday, but I have no doubt we’ll see plenty more dark horse contenders from the va’a world “stand up” and announce themselves as genuine contenders. It’s a very interesting time for our sport, with the world’s strongest paddling nation fully embracing the world of stand up paddle racing. It’s been great to see so much fresh blood enter the sport over the past 12 months, not just from Tahiti but around the world. At the same time as Titou and the Tahitians are battling it out, the other big race this weekend, the Victoria Cup in Japan, will showcase many “New names to watch” such as Michael Booth, James Casey and the Hasulyo brothers, who will be taking on the established world order of guys like Connor, Kai, Mo and Casper. While you’re waiting, here’s an interview Titou did with Tahitian TV to preview the race (though if you don’t know French you won’t understand a single word of it…).